There’s no question that business models for today’s electric utilities are shifting. Their traditional role as electricity suppliers is being challenged with stagnating or declining electricity sales in some regions. Increasingly popular distributed energy resources (DER), including onsite solar photovoltaic (PV) panels and energy-storage devices also are having a revenue impact. European utility executives polled by the market-research firm IDC Energy Insights think new business and services supporting their commodity-electricity business will account for about 40% of utilities’ revenues by 2020. To meet changes, many distribution system operators (DSOs) are exploring new sophisticated digital technologies. They desire modernizing power distribution system operations and wish for creating stronger customer relationships. These companies are finding that such digitization efforts can open new revenue streams for growing their businesses, beyond traditional energy sales. Three digital technologies are particularly used by utilities. They offer opportunities for business transformation. Sensors, matched with sophisticated and advanced software and automation tools, are deploying to better address the utilities customers’ growing demand for onsite PV and storage. Distribution substations house the switches, capacitors, transformers and other assets used to keep grid power flowing smoothly. Pairing sensors to these components with increased automation supports faster network reconfiguration, so outages can be minimized. And, with more accurate voltage and power measurement, DER can be more easily integrated, with real-time voltage management to stabilize fluctuations, even when integrating intermittent distributed generation. Smart meters act like the digital front doors to customers’ homes. They are increasingly run in conjunction with internet-connected thermostats, water heaters and other appliances. With this technology, utilities gain new capacity for offering demand-reduction and time-of-use rate plans. Thereby customers save money and DSOs get support to balance demand on their distribution systems. Digitized smart grids give DSOs an easier path toward the integration of customer-sited technologies in the early stages of deployment. The nascent market for electric vehicles, for example, offers one of the few opportunities for load growth in our increasingly efficient world. But these emissions-free cars, trucks, and buses pose operational challenges. With a digitized distribution system, DSOs can monitor charging operations in real time and offer rate plans that incentivize grid-friendly charging schedules. Such systems could even call on the batteries in customers’ electric vehicles as a new distributed resource for aid in load balancing and other ancillary services. 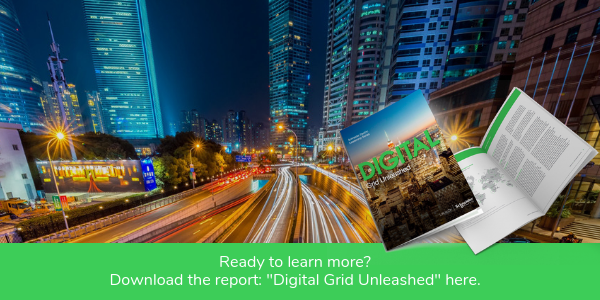 You can learn more about the business advantages electric utilities are discovering through increasingly digitized grids in the new report, “Digital Grid Unleashed.” Download it for more insight into the changes, challenges and opportunities these new technologies might present for today’s utilities. These are really good words about our present and future business model. Strategic good information. The Digital Path to Electric Utility Transformation Leadership Digital Tech Helps Electric Utilities Improve Customer Sustainability—And Their Own Utilities Must Digitize to Transform and Perform What’s Driving Energy Efficiency Improvements at Electric Utilities?